The Board of Directors for the time being for the Company. The By-Laws and any amendment and addition thereto for the time being in force. The Rules and Regulations and any amendment and addition thereto for the time being in force. Words importing the singular only shall include the plural and vice versa. Words importing the masculine gender shall include the feminine and neuter gender and vice versa unless the context otherwise requires. 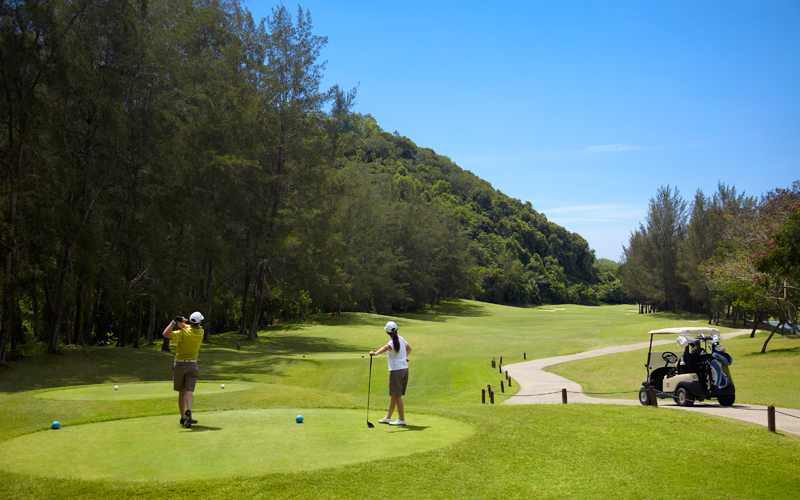 The name of the Club is Dalit Bay Golf & Country Club Berhad. The Club is situated at Pantai Dalit Beach, P O Box 578, 89208 Tuaran, Sabah. The Club is a proprietary club, the proprietor of which is the Company, a limited company with a Board of Directors entrusted with the policies, management and operations of the Club. Every Member of the Club shall subject to these Rules for the time being in force, be entitled to use and enjoy in common with other Members of the Club, the golf course, the clubhouse and the facilities therein provided by the Company. A Member shall not by reason of his membership, be under any financial liability except for payment to the Club of his membership fee and any other sums due or levied under these Rules and he shall not by reason only of his membership have any proprietary rights over the Club, its monies, properties and assets. The Board may appoint (and remove) a person or persons of high rank and distinction to be the Patron of the Club. The Patron shall enjoy all the rights and privileges of a Member. The Board may invite any person to be Honorary Member for such period on such terms and privileges as it thinks fit. An Honorary Member shall enjoy all the rights and privileges of a Term Member but shall not be entitled to transfer his membership. The Board may offer licences to any person whether an individual or a body corporate for such period as the Board may determine to enjoy all the rights and privileges of a Member but subject to a payment of a licence/membership fee as the Board may from time to time determine. An Honorary Member and a Term Member shall be entitled to the nonexclusive use and enjoyment of the clubhouse and all other facilities and amenities of the Club. Any person may be introduced by a Member as a guest of the Club. Such guest shall be entitled to use the Club Facilities and he shall be governed by these Rules and to any conditions or restrictions which the Board may from time to time prescribe. Any guest using the Club Facilities shall pay such fees as may be prescribed from time to time by the Board and shall be allowed to use the Club Facilities on such days and at such times as the Board may prescribe. A Member shall register all guests and shall be responsible for any debts to the Club incurred by such guests. Any Member who introduces guests shall be liable to the Club for all monies due to the Club by their guests and shall also be responsible for the proper conduct and due observance of these Rules by the guests. The Board may at any time and without giving any reason therefor withdraw the privileges and Club Facilities from any guests. No person who has ceased to be a Member or from whom the privileges of the Club have been withdrawn may be introduced as a guest into the Club. The Board may at any time allow persons staying at any hotel whether or not owned by the company or its related companies or from other clubs such rights which it may deem desirable to use the Club or any of its facilities and may fix and regulate the fees payable and any other conditions in respect thereof. Signing facilities are unavailable to all Members of the Club. If any Member acts in any way prejudicial to the interest of the Club or its Members thereof or shall fail to observe any Rule, then the Club Manager shall inform the Board, which shall consider the conduct of such Member at a meeting. If at such a meeting there is sufficient evidence to charge the Member, a notice in writing shall be given to such Member informing him of the charges and calling him to attend a meeting for the purpose of answering such charges. At such a meeting the Member has the right to be heard. After hearing such Member the Board shall decide to expel, suspend or to impose any other lesser penalty on the said Member. Upon the Board’s decision, written notice of such decision shall be sent to the Member by the Board. The Board’s decision shall be final. No appeal shall lie from it to any other meeting or to any court of Law. A person expelled from Rule 10.1 shall not thereafter be eligible for membership to the club nor be admitted as a guest of any other Member. shall cease to be a Member. The Board shall have full power to make, alter, add to or repeal these Rules, and such Rules so made, added to, altered or repealed shall come into operation at such time as may be determined by the Board. The Board shall have full power to decide on all matters relating to the Club and the Management of the Club and all matter relating to Members and all maters arising out of or are not covered by these Rules. The decision of the Board on the abovementioned matters shall be final. The Board may from time to time make By-Laws concerning any of the matters referred to in these Rules, governing and regulating any matters relating to the Club whether as regards to the use and enjoyment of any of the Club Facilities or otherwise and such By-Laws shall be deemed to form the integral parts of these Rules. It is intended that the By-Laws shall deal in greater detail with the specific rules governing and regulating the conduct of the Members and whatever applicable, the conduct of the spouse, Children, the guests of the Member, the visitor and the use of the Club facilities. The By-Laws may also deal with any matters that are not set out in these Rules. The Board may at any time and from time to time vary, amend, add to or revoke the By-Laws for the time being in force. The By-Laws shall, until revoked, be binding upon all Members. No Member shall have the right to participate in the management of the Club. All complaints from Member shall be made in writing to the Club Manager who, if he shall be unable to deal with them shall submit them to the Board whose decision shall be final. All fixtures, furnishings, ornaments, plants, fittings and other things situated at the Club (other than the personal belongings of a Member brought to the Club for the use of the Member), is the sole property of the Company and shall remain the property of the Company. No Member or a member of his family or his guest shall under any circumstances whatsoever take away, or be permitted to take away, from the Club, or damage or destroy any property of the Company. In the event that any Member or a member of his family, or his guest takes away or damages the property of the Company, the Member shall pay to the Company the cost of making good the damage or the cost of replacement of such property. The amount of such cost shall be assessed by the Club Manager whose decision shall be final. No paper, notice or placard shall be exhibited in the Club premises, or in any way brought to the notice of Members without the sanction of the Club Manager. Every Member shall communicate in writing any changes of address to the Club Manager. Upon notification of such change the new address shall be updated in the membership account. Gambling of any kind is not permitted on the Club premises. The introduction of materials for unlawful use or drugs into the premises is prohibited. Members are strictly prohibited from bringing animals onto the golf course, practice areas or the premises of the Club. The use of radios, transistors and other similar equipment in any part of the Club’s premises, golf course or practice areas is strictly prohibited. No Member shall be given any gratuity or money to any Club employee unless specifically authorised by the Board. No food or drink other than that bought from the club may be brought into any part of the premises of the Club except for baby food or food prepared for medical reasons only. No Member shall borrow in the name of, or pledge the credit of the Company. No Member shall indulge in any political activity or allow funds and/or premises of the Club to be used for political purpose. No Member or member of his family or guests shall reprimand a Club employee. If a Member has any cause for complaint against a Club employee, he shall address such complaint to the Club Manager in writing. No Member shall give the address of the Club in any advertisement, or use the Club’s address for his personal and/or business purposes. Persons under the age of eighteen (18) are not permitted to consume alcohol whilst in the Club and are not allowed in the bars of the clubhouse. The Company may enter into reciprocal arrangements with any other club or clubs upon such terms and conditions as the Board may deem fit. The clubhouse shall be open daily from 7:00am to 8:00pm. These hours may be altered, extended or restricted at the discretion of the Board. Child minders employed by Members may only accompany Children below the age of twelve (12) to such places as permitted under there Rules. Similarly, physically handicapped Members, guests or visitors must be accompanied by attendants, where necessary. The Company shall not be liable for any injury whatsoever and howsoever caused, whilst in the Club, to a Member or a member of his family, his guests, his caddy or visitors to any other person. The Board may impose fines for each offence on Members who part, or permit to be parked, cars and other vehicles in contravention of any regulations as to parking that may from time to time be in force. The Company does not accept any responsibility for any loss, damage or injury whatsoever and howsoever caused to any car, its occupants, or its contents while parked at the club premises. All subscriptions, fees, fines or damages payable or imposed under these Rules shall be a debt or liability to the Club and shall be recoverable from any Member who is liable for the same, whether primarily or otherwise, under the Rules. Membership cards must be produced on every occasion when signing for the services at the Club or when requested to do so by an authorised Club employee on the Club premises and grounds. Membership cards are not transferable. Any Member loans out his membership card will be subject to disciplinary action. All Children cannot introduce guests. Members should dress appropriately in and around the club premises. Members are not permitted to fish in any of the lakes or ponds at the Club premises except as permitted by the Management.